This little tray would be a useful thing in many parts of the house, but can be used to catch all the ends of thread you trim away while stitching, or to keep the beads from rolling away when you are working with them. 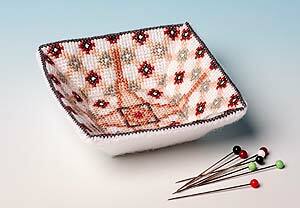 Worked in a Victorian tile pattern to match the Victorian Mansion Sewing Box, the tray is 3 cms high and 9 cms square. The coloured pins are not included in the kit.